Homemade Healing Mixture for Dry and Cracked Feet - Oils are rich in essential fatty acids, particularly linoleic acid. Linoleic and linolenic acids are needed for the growth and maintenance of cells, tissues, and the entire body. Other than vitamin E, vegetable oils contain negligible amounts, if any, of other nutrients such as the B vitamins and minerals. Some of the oils richer in vitamin E are soybean, safflower, cottonseed, com, and wheat germ. Bone Fractures - When bones receive more pressure than they can withstand, a fracture occurs. Some of the more common causes are falls, car accidents and sports injuries. Indigestion - Most people will suffer from indigestion (also known as dyspepsia) at some point in their lifetime. This condition is typified by pain or discomfort in the chest or upper abdomen after eating. Gastroenteritis - Gastroenteritis is typically caused by an irritation or infection of the intestines or stomach. It can cause diarrhea, vomiting, nausea, bloating and abdominal cramping. Gastritis - Gastritis is most commonly caused by an infection of Heliobacter pylori bacteria, which is also the primary cause of ulcers. Fever - The human body has a "thermostat" in the hypothalamus in the brain. Every person has his or her own standard temperature setting, which is typically around 37⁰C, or 98.6⁰F. When this temperature rises, people are known to be experiencing a fever. Fertilization - Both ancient and modern cultures have recognized the need to cleanse and ready the body prior to conception to ensure the optimum health of the sperm and egg—and to maximize the chances that an egg will be fertilized. Third Trimester - Approximately 10% of American women develop high blood pressure, or hypertension during pregnancy, most frequently in the third trimester. In most cases, the elevation is mild and produces no adverse symptoms. Second Trimester - More than 50% of pregnant women complain of experiencing morning sickness at some time during their pregnancy. Typical symptoms include nausea and vomiting, especially in the morning, but which can occur at any time. Fertilization typically takes place within 24 hours after a sperm encounters an egg inside the fallopian tube. Only one of the millions of sperms will pass through the membrane of the female egg, or ovum. Once the sperm has fertilized the ovum, enzymes in the egg alter the inner membrane and make it impossible for more sperm to enter. Once introduced, the nucleus of the sperm and egg, each containing 23 chromosomes, unite to form one fertilized egg. The fertilized egg then travels to the womb where it embeds itself in the lining of the uterus and begins to grow. A fertilized egg in the wall of the uterus will soon divide into many cells and begin to form the embryo's organs. Just five weeks after fertilization, the embryo develops a nervous system, skin, muscles, and internal organs. By the eighth week, the embryo is three centimeters long and has a complete nervous system, a beating heart, a fully-formed digestive system, and the beginnings of its unique facial features. By the 16th week, its heart and brain are well developed; and by the 26th week, its lungs are functional. Many pregnant mothers experience the effects of heartburn and constipation (either due to the slowing of digestion or due to the size of the uterus) which will begin crowding the stomach and intestines. An obstetrician may recommend that the mother partake of a more bland diet consisting of unprocessed and unseasoned foods. The obstetrician or naturopath may also prescribe natural antacids for heartburn and herbal laxatives for constipation. Generally speaking, prescription drugs should be avoided as they may have toxic effects on the fetus. More than 50% of pregnant women complain of experiencing morning sickness at some time during their pregnancy. Typical symptoms include nausea and vomiting, especially in the morning, but which can occur at any time. Expectant mothers should ask their obstetrician or nutritionist whether taking vitamin and mineral supplements will help prevent these symptoms. 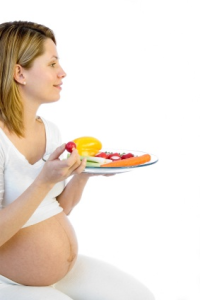 Vitamin B6 supplements, for example, reduce nausea and vomiting during pregnancy. Vitamins K and C, when used together, have also been shown in clinical trials to be helpful. In one study, 91% of patients who took daily vitamin K and C tablets showed complete remission within 72 hours. Women might also consider consuming natural herbs which have proven effective in relieving morning sickness. For example, eating a small amount of fresh ginger has proven to be quite effective in alleviating morning sickness. In one study, ginger was shown to be far more effective than Dramamine, a popular prescription drug used for relieving nausea and vomiting. Virtually everyone knows what "stress" is, although it is especially important for a pregnant mother to understand how it affects her body and her fetus. During pregnancy, labor, and childbirth, the woman will experience a variety of stresses, some of which are unavoidable. In addition, she will also undergo substantial hormonal changes which will affect how she reacts to stressful situations. For example, she may feel more irritable, anxious, or fatigued as her baby becomes larger in the womb. Biofeedback training is a method of learning how to consciously regulate brain waves, breathing rhythm, heart rate, and blood pressure. Biofeedback machines are simply computers with wires that attach to a patient's skin which measure important biological processes such as the heartbeat. Chronic stress also increases the mother's heartbeat, and when her heart beats faster, so does her baby's. This influences the baby's development while inside the womb and also affects the baby's heart rate after birth. This was demonstrated by an interesting experiment conducted with a group of newborn babies. In the experiment, researchers played several tape recordings of a mother's heartbeat. When they played a tape of a normal heartbeat of the mother, the babies became quiet, breathed evenly, ate well, and gained weight. When the recording of the heartbeat was speeded up above normal, the same babies became restless and began to cry. Biofeedback has many beneficial uses during pregnancy. In the latter part of her pregnancy, for example, a mother may find that her legs and feet become painful, or that she develops varicose veins—swollen leg veins caused by increased blood pressure due to the weight she has gained. In some cases, these symptoms result because she places a disproportionate amount of weight to one side of her body. Three to five percent of all pregnant women develop diabetes during pregnancy, usually during the second trimester. Pregnant women with diabetes will find practicing asanas especially beneficial.